Kueh Dadar, sold out again! 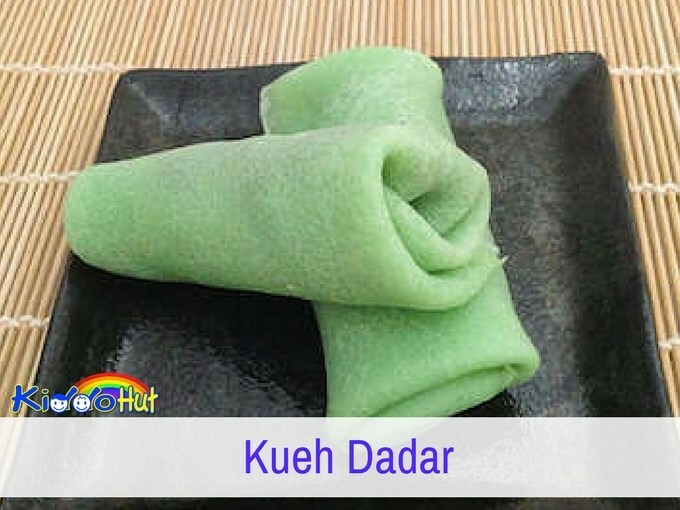 At times, when I have this craving of eating Kueh Dadar, it is just sold out. Frustrated, I was determined to do this Kueh at home. And, it also turns out to be my mum and hubby’s favourite Peranakan kueh. All the more I should master it. It shouldn’t be too difficult I thought. Nevertheless, I didn’t make it during the first attempt. 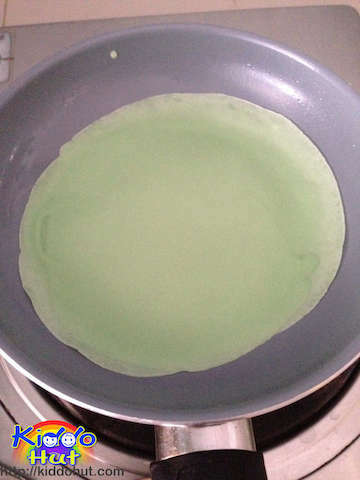 Not to be beaten by the green crepe, I was determined to try it again. Woohoo! The second attempt was a success! So, what went wrong during the first time? The batter was too thick. It is all about flour and water/coconut milk ratio. And, the batter should be a little watery. 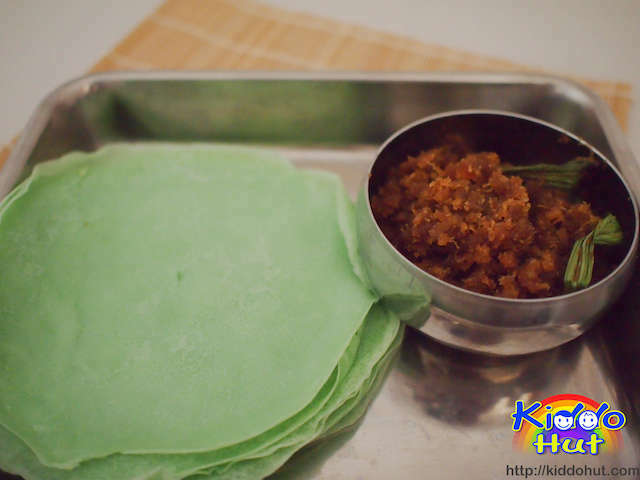 I have modified the recipe from Travellingfoodies by using more coconut milk and lesser water, to make a more aromatic skin wrap. 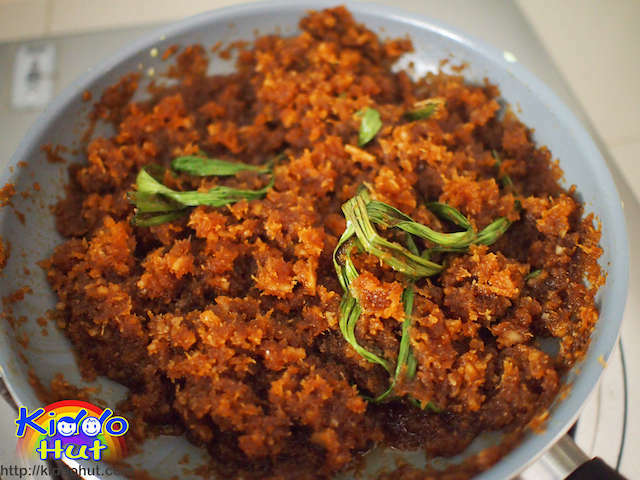 There are some takeaways from my experiences in preparing this kueh. 1. The non-stick flat pan should be lightly greased. Lightly greased means very very little oil, just on the surface. Too much oil may cause the skin wrap to be unevenly cooked and browned too fast. Since it is a non-stick pan, the skin wrap shouldn’t stick onto the pan but to enable the skin wrap to glide around in the pan with ease, it is better to grease the pan lightly. 2. The heat has to be kept low at all times. It should be at the lowest to prevent the bottom of the skin from browning too fast whilst the other side is not cooked. 3. Do not add too much batter in your first attempt. Check the desired thickness of the first skin wrap to ascertain how much batter you should be pouring into the pan. If the skin is too thick, it could crack during the wrapping process. 4. When pouring the batter, lift up the heated pan and tilt it slightly to the side facing you. Pour the batter slightly above the centre of the pan and swirl it gently around to coat the entire base suface of the pan. You have to act pretty quick as the batter turns translucent pretty quickly. 5. When the sides of the skin are crisping up, glide the skin around in the pan. 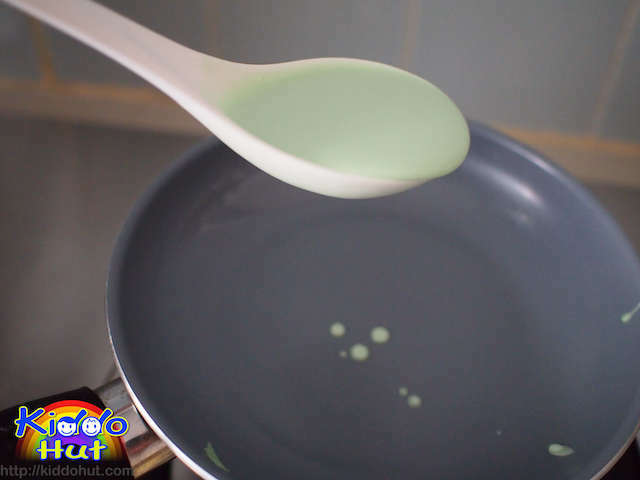 If it is able to glide smoothly around the pan, you can flip it. 6. Some people is able to toss it into mid-air but I can’t. So, I transferred the skin to a lightly greased flat aluminium surface, I used the bottom of the tin (see picture) and flip it either using the flat spatula or bare hands. 7. With regards to the intensity of the colour, I suggest you test the batter by cooking some small amount before adding more colouring/extract/paste unless you don’t mind the intensity of the colour like me. I prefer not to add too much colouring on my food. Hope these 7 tips help! Let’s start the cooking! 1. 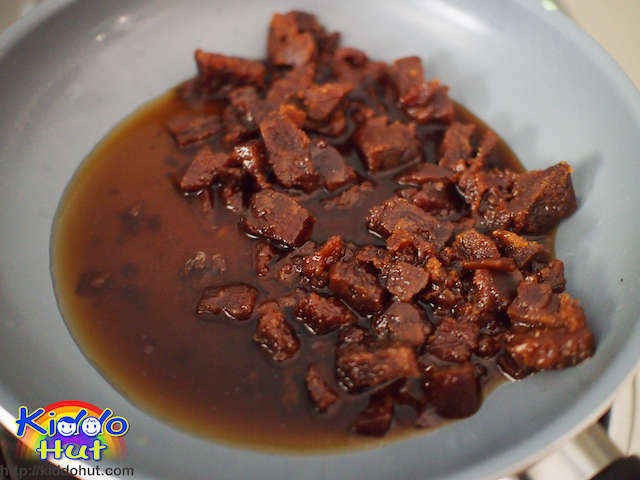 Dissolve the gula melaka in the water over medium-low heat. 2. Add pandan leaves, salt and grated coconut. 3. 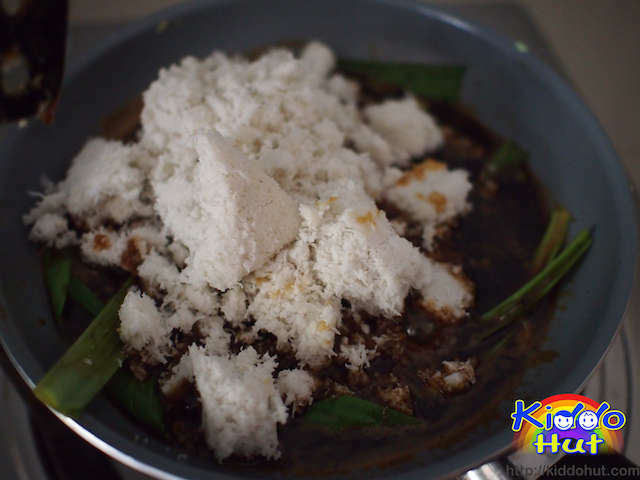 Stir until the grated coconut is coated with the gula melaka syrup. 5. Turn off heat and set aside to cool. 1. Mix flour, coconut milk and water. Mix well. 2. 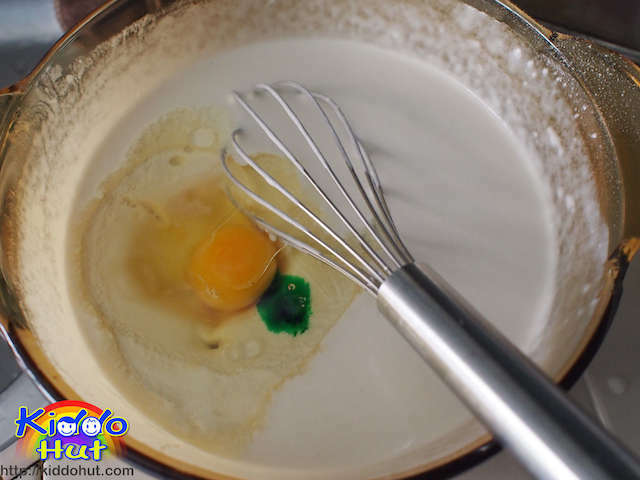 Add egg, salt, cooking oil and pandan paste/extract/colouring to the batter and mix until a thin batter is formed. It should look rather watery. Adjust the consistency of the batter with more flour, or water. 4. Heat the non-stick pan over low heat. Grease the pan very lightly with cooking oil. 5. Lift the pan off the stove, tilt it slightly to the side facing you. 6. 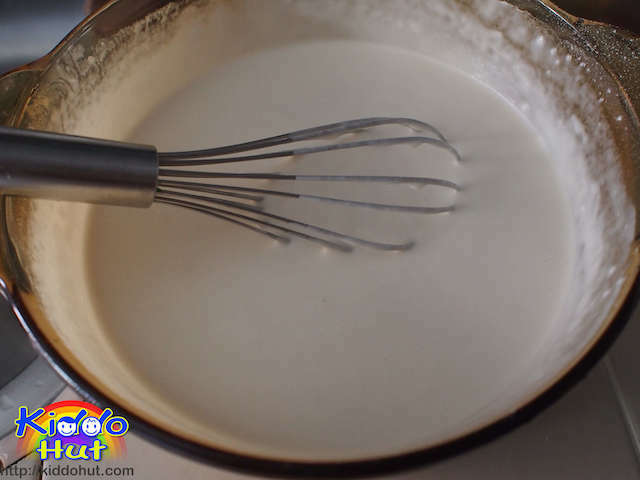 Pour the batter into the pan, slightly above the centre of the pan, and swirl the batter around to coat the entire base surface with thin layer. 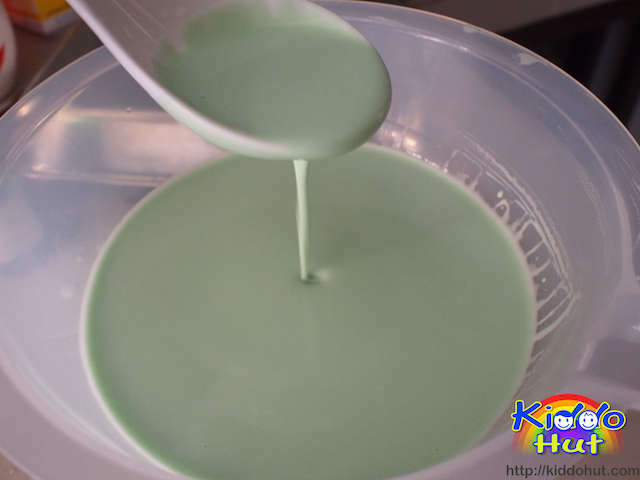 You have to do this pretty fast as the batter turns to translucent green pretty quick. 7. 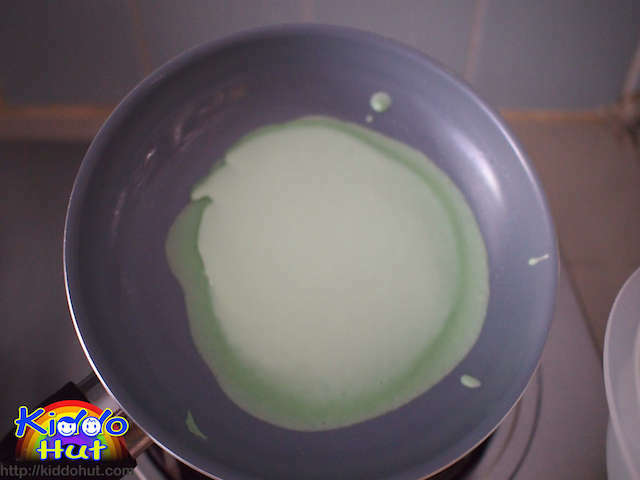 Leave the batter to cook slowly until the bottom side is able to glide around the pan easily with some swirling. 8. Flip the skin and cook for another 15 seconds or so before transferring to to a greased aluminium tin surface. 9. Repeat the process until all batter is cooked. Remember to stir the batter before each pouring to prevent the flour from settling at the bottom. 2. Add approximately 2 tbsp of filling onto the skin nearer to you, about 2 cm from the edge. 3. 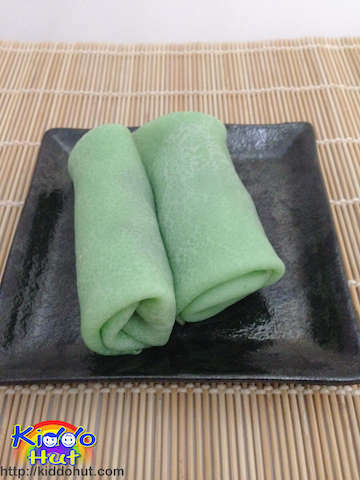 Fold the left and right sides of the skin towards the centre, then lift the end nearer to you and fold up before rolling it over the filling and the folded sides. Continue to roll away from you and exert a little pressure on the skin and filling to secure everything. 4. Repeat the process for all the skin wraps.